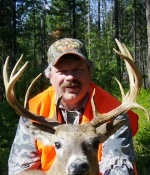 Washington is a relatively unknown whitetail deer hunting destination. 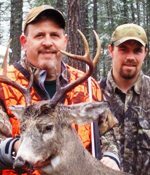 Bearpaw Outfitters offer quality hunts for "Northwestern Whitetail Deer" in northeast Washington which is by far the most productive deer hunting area in the state. 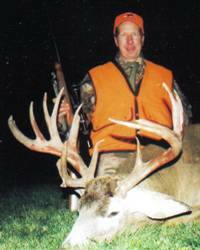 Choose a guided, semi-guided, unguided, or guaranteed whitetail deer hunt. Accommodations and meals are included in the lodge and cabins. DIY Whitetail Deer Hunting Maps are also offered. Over the counter licenses are available. Call Dale or Tara (509) 684-6294 to ask questions or book a hunt! Hunt NE Washington by Idaho and British Columbia. Bearpaw Outfitters hunt over a million acres of public land and lease numerous private ranches ranging from 200 to 2000 acres. There are valleys, rolling hills, and high mountains with evergreen forests, logging cuts, and farm fields. Bow season runs Sept 1-29, muzzleloader Sept 30-Oct 8, rifle is Oct 14-27 and Nov 11-19. 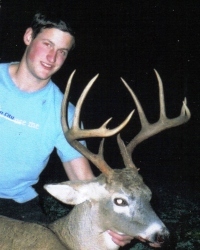 Some very large bucks are taken every year but Washington doesn't manage for trophy deer. It's recommended to take the first buck seen to assure success but it's your choice on what bucks to pass or shoot. Mountain Areas: Some of the largest bucks are taken in the mountain areas. Guided hunters usually average 40% to 60% shot opportunity. Private Ranches: Higher deer numbers but not usually the biggest bucks. Hunter numbers are limited to maintain 90% to 100% shot opportunity. Mountain Hunts: Hike or glass mountain ridges and hillsides, game trails, logging cuts, bait sites, water holes, or drive mountain logging roads. Hunters wanting to hike while hunting should choose a mountain hunt. Private Ranches: Hunt in blinds or stands at food plots, bait sites, alfalfa fields, orchards, game trails, or waterholes. Because hiking scares deer off it's not permitted, the guide will pick you up and drop you off. Physical condition is not that important. Anyone can enjoy a high degree of success when hunting in blinds and stands or in the easier to access areas. Hunters in good physical condition can challenge themselves by hiking as much country as desired on the mountain hunts. Check the Weather Channel before leaving for your hunt. September usually has warm days and chilly nights, October days are 30's to 60's with frosty nights. Rain or snow is possible, but early snow usually melts quickly. Guaranteed Hunt: If you've had really bad luck deer hunting this is the hunt for you, if you don't get a shot opportunity we'll refund half the hunt fee. Guided Hunt: Includes a guide with 4x4 vehicle for 2 to 4 hunters, lodging, meals, field dressing, retrieval, and skinning. These hunts are not guaranteed. Semi-Guided: Includes pre-baited hunting spots, lodging, meals, and help skinning your deer. Bring a 4x4 vehicle to hunt on your own. Unguided Hunt: Includes a hunting map, advice where to hunt, meals, lodging, and game cleaning area. Bring a 4x4 vehicle to hunt on your own. DIY Hunting Maps: At least 4 hunting areas are marked on a map and sent to you for a do-it-yourself type hunt. This saves you hundreds $$$ in fuel and time wasted searching for where to hunt. No other services are included. Meals are served in the lodge dining room, five cabins each have bunk beds for 2 to 4 hunters, indoor bathrooms, and a lighted game cleaning area with water. Groups of up to 14 hunters can be accommodated. Motels are only 10 minutes away in Colville for hunters who would rather stay at a motel. Your personal gear, meat processing, taxidermy, licenses, sales tax, gratuities for guide, and any other items not listed as being included. The license and tag is sold over the counter. All youth hunters under 16 are half the price of resident adults. First time hunters can apply for a one time deferral of the Hunter Ed requirement. All other hunters born after Jan 1, 1972 need Hunter Ed. Hunters must wear 400 square inches of hunter orange above the waist during rifle deer, elk, and upland bird seasons. Both services are available locally, meat processing is usually done in a day or two, or you may choose to transport your trophy and/or carcass home. The Spokane Airport is 81 miles, it's about 1 hour 40 minutes to Bearpaw. Check the Details Page for flight and rental car information. Driving Directions: Follow I-90 to Spokane, exit onto Hwy 395 north and follow to Colville, turn east on Hwy 20 (3rd Street), go 3 miles to Bearpaw Outfitters. Call Dale or Tara (509) 684-6294 to ask any questions or book your hunt. Use the Hunt Application if mailing your deposit. Sign up for the Wild Update Newsletter to receive updated hunting info and reminders of license deadlines. "We look forward to meeting you and hunting with you!"